"Bugnes are a doughnut-like pastry sprinkled with icing sugar that hail from Lyon. They're essential to Mardi Gras! A tradition that I never forget... making bugnes! I have loved them since I was a kid. My mother's bugnes (and now mine) have a little bit of lemon for a unique taste. Sprinkle with icing sugar before serving." Mix water and yeast together in a small bowl. Let stand until foamy, about 15 minutes. Combine flour, eggs, butter, 1/2 cup plus 2 tablespoons sugar, and lemon zest in a large bowl; add yeast mixture. Knead by hand until dough comes together. Cover with a clean dish towel. Let rise in a warm place until doubled, about 2 hours. Roll out dough into a large rectangle on a lightly floured work surface. Cut into diamond shapes using a small pastry wheel cutter. Brush off excess flour. Heat oil in a deep saucepan or wok. Cook doughnuts in batches until golden brown, about 1 minute per side. Drain on a paper towel-lined platter. 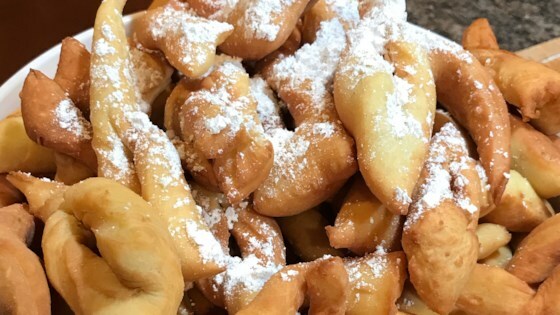 See how to make pillowy beignets like they serve at Café du Monde. To test if the oil is hot, dip 1 piece of dough and look at the change of color. The color should change very quickly.